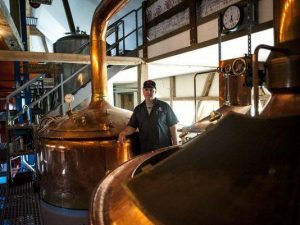 The Wildwood Brewery is a state of the art brewing system. It starts with three malt silos which can hold nearly 100,000 pounds of bulk malts. The malt is brought into the building with a cable and disc conveyor and empties into the malt hopper where it is electronically weighed. An intermediary hopper is used to add specialty grains which come in bags. The malt gravity flows from the malt hopper through a Künzel 4 roller mill and into the grist hopper. The Künzel is the BMW of malt mills. The grist is brought out of the bottom of the grist hopper with a screw auger, which empties into a bucket elevator bringing the grist up more than 25 feet. The elevator empties into a chain drag conveyor which gently moves the grist to the mash kettle. A grist hydrator is used to evenly mix the dry grist with temperated brew water. The mash kettle was designed by Mr. Lueders in 1992 and custom made by Mueller, Springfield, Missouri. The other three vessels of the four vessel brew house were made by BAM, Freising, Munich. These vessels include a Brew kettle, a lauter tun, and whirlpool. There is a 50 hp high pressure boiler, two 50 bbl hot liquor tanks, and a 30 ton chiller. A 1000 square foot cooler building is built in the shadow (North side) of the larger brewery barn. For additional efficiency, there is a 600 gallon glycol reservoir inside the walk in cooler. An outside 600 gallon water/ice tank which includes a heat exchange coil can be used as a pre-chiller at times when the temperature outside is below 30°F. There is cellar capacity of 240 barrels.